Those of you who are or have been in a marriage or long term relationship know that they require a lot of hard work and commitment. But unfortunately sometimes all that work is still not enough to stay together. Hollywood couples and relationships are like any other in that sometimes they do not work out. The most recent example being Jon Hamm and his long term partner, Jennifer Westfeldt. 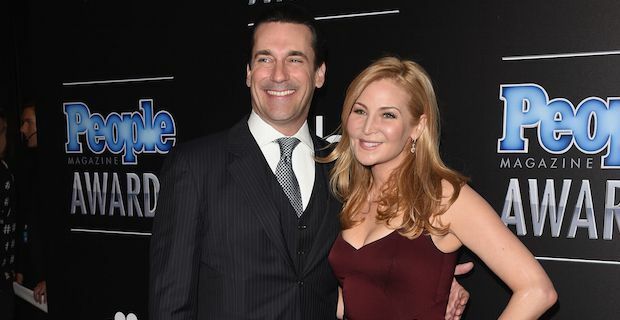 44-year-old Hamm, who is most notably known for his work as Don Draper in Mad Man, has been with film writer, director and actress Jennifer Westfeldt for 18 years. They met back in 1997 and have since worked together in Kissing Jessica Stein (2000), Ira and Abby (2006) and Friends with Kids (2011). Hamm was struggling with alcohol abuse and completed his 30 day rehab program earlier this year during which Westfeldt was very supportive. In April, In Touch rumoured that the couple was splitting, but it was strongly denied. They were last seen together in New York during the premier party of the Netflix series Wet Hot American Summer: First Day of Camp. They have know joined the list of other 2015 Hollywood break ups which consist so far of Ben Affleck and Jennifer Garner after 10 years of marriage, Gwen Stefani and Gavin Rossdale after being together 13 years, Patrick Dempsey and Jillian Fink after 15 years of marriage, Stephen Collins and Faye Gant after 30 years and unfortunately the list goes on and on. Hopefully there won’t be too many more this year.